13 March, 2018 At 9:30 and without my endearing morning coffee (because many times it is impossible to get hot water) I took my backpack and started my way, since I had to meet Father Gustav at 10am on his parish. There would also be Ange, the person who would take me to a small village called “Tataman” located on the shore of the Black Volta River. (The Black Volta forms part of the border between Ghana and Côte d’Ivoire and Burkina Faso) As soon as I arrived, I found both of them in the middle of a conversation. We warmly greeted each other and immediately Father Wilfred came to wish “Bon voyage” – as French people say. We were going to travel on a motorbike, which I am not skillful at all; however, the important point here is not to be able to ride a motorbike, but to know the undiscovered ways that lead to remote villages such as the one I went to this day. The road to this village nor the names of the villages we went by appear in any map (not even in the powerful Google Maps). That’s why dear readers, today we’ll have the privilege to meet places and unknown people, whom only very few western people could meet on distant times. The journey to Tataman was really exhausting. It was by far the most difficult trip I’ve done in my entire life. It was a three-hour-motorbike ride through extremely narrow and zigzagging pathways (with occasional vehicle tracks) full of obstacles: huge stones that made us jump about a meter and a half high, destabilizing sandbanks, bushes and trees which scratched our heads and legs, etc. However, the heat (41%) and the striking sun were the really unbearable things. My portion of water had already finished and it was really complicated to obtain water to refresh our body and quench our thirst. Eventually we found a village where there was a kind of pantry. We entered immediately looking for drinks. The good news is that the boy and his family had beverages made of cola and juice. The bad news is that all of them were kept at natural temperature. (i.e. boiling). In so far as I drank anything, I bought what I could, but I will never forget that sensation: it was like drinking boiling tea in the Sahara Desert or in the Sahel Region. These remote regions don’t have electricity, and in no way there is the possibility of drinking cold liquids. Very naïve, I asked if there were “glace” beverages (frozen, in French; my tourist and western being came out). An outrageous burst of laughter was the answer of the salesman and his fellows. Oh, I forgot to mention that in the middle of the way, the motorbike broke down….in that moment, I confess I got somehow desperate (although I strongly tried to hide it). There was no apparent remedy to fix the vehicle, nobody on our way, without food or water. Suspicious noises coming from some bushes made me think of the dangerous species (serpents, crocodiles, hippos…) willing to eat us for the lunchtime before we died of thirst or hunger. I tried to keep as calm and spirited as possible, smoking and talking to the driver as if nothing happened. The driver was catholic, as I am, so, I suggested to pray and we did it. After ten minutes, voilà! The vehicle brought round. We crossed Namldouo, Vargbor and Darteno among other villages; all of them very alike, typical of the Savannah. Eventually we arrived at Tataman, after almost three hours. It is a very poor village with brick-earth huts, roofs made of cans, sugarcanes, or straw; as well as abandoned or half-finished constructions, goats, barefoot children, with worn-out clothes wondering around. But Tataman is also a picturesque and nice place: from the very friendly people and their colorful clothes to the really varied vegetation and enormous mangiferas that eventually lead to rivers and lakes. When we arrived, we sheltered under an impressive Adansonia, also called Baobab (a typical African tree). There were two youngsters setting a trap for fish since this is a fishing town (The Black Volta River is only 200 meters away). They immediately welcomed us and offered water from their own pot (we gladly accepted). The driver, Ange, was our interpreter, and he commented the reason of my visiting their village (i.e. the preaching to pagan peoples). They showed very sympathetic and receptive; and after a moment of deliberation they sent me to the chief of the Wala village (mostly Muslim), Liú. He was a very friendly elder of about 90 ninety years old, but didn’t speak a word of English or French; that’s why, we had to ask a young villager for help. The situation was not very simple, Ange (the driver) translated my words into French, and the young man translated from French into Wala, so that the elder man could understand my speech. Afterwards, the chief gave me a warm welcome, congratulating on my labor and authorizing to preach in his villages to the animists (but not the Muslims). Moreover, he offered to call himself the other villages to gather and listen to me. What else could I ask from that generous man? After listening to him respectfully, we thanked him and went to have lunch under a mangifera. We then went to refresh ourselves with a dip in the Black Volta River, swimming so far as Ghana, on the other side of the river (it was only 15 meters away). This minuscule river separates the two countries, and apparently the smuggling of goods (cigarettes, etc.) enters through it. The water was boiling and dark, but at least it was “wet”….. What I´ll tell you now, seems like a tale… in that moment I asked the dwellers about the state of the art of the water pumps in their villages, and they told me they were constructing one at that moment. There was something I couldn’t figure out yet: “What is the source of the water we had just drunk?” I asked innocently. “It comes from the same place where you are now” they said. “Why had I asked….? I thought, and prayed not pick up an African diarrhea. As soon as we finished, I was taken to a village called Galaso, inhabited completely by pagans, including some atheists. As the tradition establishes, we had to ask for permission to the chief of that village (conformed mostly by the Loby), who not only accepted but also sent for the few villagers that were hanging around to meet us. Now, the most beautiful part of this experience comes. People got together, at the beginning with some initial reservation and distrust. We explained the reason of my visit and showed the big images I brought with me, the Divine Mercy of Jesus and the Virgin of Schoenstatt, and started my humble preaching. To tell the truth, it was my first preaching! And I felt quite nervous. My background and experience have always been involved in intellectual and action fields, so to speak. I’m not the most pious person in the world….but Father Federico had encouraged and trained me for this glorious mission. Thanks God, I think that in spite of my many flaws, everything went on well, and the objective was achieved: we did the first announcement of the Gospel to this community. We talked about transcendental issues (life, death, but especially about life after death) we prayed, presented them God, Jesus, the Virgin Mary, to whom they must entrust their prayers to ask for their spiritual and material necessities. Ange, the driver and by now my very good friend, helped me in this effort. Most of the villagers seemed very happy, particularly one, whom I gave him my rosary. Before saying goodbye to these good people I gave them the blessed images so that they could venerate them at any time, and have always present Jesus Christ and our beloved Virgin Mary. It seems incredible that in this zone located only 40 kilometers away from Bouna neither a priest nor preachers had never been and visited to every village. When I asked about this situation to one of the priests, he told me that one reason was the large extension of the Dioceses, which is about 200 kilometers; thus, it is very difficult to reach the most remote places, and besides, being so few, they have to be in charge of the administration and maintenance of the Catholic community from the zone. But the main obstacle is the highly complicated access to this kind of villages: there are no ways, the journey is really exhausting and there are more than six hours to and from these places. Thanks God, we were able to do it. I was announced the best news the day after my adventure: the local parish confirmed that a local Catholic will be sent to set up in Tataman and start covering the animist villages to preach the Gospel for the first time. 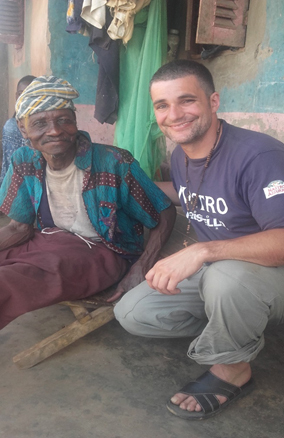 That is to say, there will be a permanent preacher for Tataman and all the Black Volta River villages! Anyway, it would be desirable that a priest could go there and as many volunteers as possible for this great mission. (Dear readers: all of you can participate in the OGP Countdown Mission). My mission in Côte d’Ivoire comes to its end for now, since my extremely tight itinerary compels me to set off for Burkina Faso tomorrow at dawn. I will tell you the story later. Huge hug, Cristián. God, Homeland and Home.